Today my heart is heavy. It has been 6 weeks since my sweet one went to Jesus. Today is also International Childhood Cancer Day. Today ALSO happens to be the day that I will step back into the halls of Children’s Medical for the first time since I left my baby there 6 weeks ago. Today is heavy but, today also has purpose. When we were at the hospital, I was very hesitant to make friends. While I know having a strong network of other cancer families is very important, it’s also incredibly hard to take on the grief and worry of other people while you’re right in the middle of fighting for your own child’s life. At least, that’s how it was for me. I didn’t really put myself out there to make friends because it just felt like too much. Too much worry, too manny tears, and just…too much CANCER! Sure, I followed the Children’s Cancer Family Page on Facebook, knew several names and faces, even had some good conversations but, as far as like exchanging numbers and becoming true friends…I just couldn’t do it. Self protection I guess. The Lord knew better for me though because 5 weeks into our treatment another Tyler family was hit with Leukemia in their 4 year old son, Jase. They were at the hospital with nothing and I knew that feeling all too well so I went yo Walgreens, made a care bag, and left it at the nurse’s desk for them with my phone number. Shauna, Jase’s mom text me that night and my first real cancer friendship was born. They visited us every week when they came for chemo and I just love them so. 6 days later, Sophie’s best friend from church, Addie Leigh and her precious mom Tami showed up with Leukemia as well. Tami and I were pregnant together and friends from church so obviously, God sent us both to Children’s for each other. We also are pretty similar to each other which is great! She has been invaluable to me and I’m so thankful for our growing friendship in the midst of the horrible. In August, when Sophie relapsed, we sat in the ICU waiting room while she was sedated and intubated. I see a guy walk in with like 23 children! Ok-it was like 8 but it seemed like a ton to my tired brain. I hear his children asking ‘How can mom nurse the baby if the baby can’t go back in the icu room? !’ They were seriously distraught. I immediately interjected-sorry to eavesdrop but you guys need a Ronald McDonald room ASAP!-We quickly found out Dustin and Jessica were the parents of Abigail who had just had her kidney removed with a Whilm’s tumor. They were beginning their cancer journey right there where we did-in ICU. We’ve since formed the most incredible friendship with them! Then lastly, my sweet friend Lindsey. I had seen her daughter Kaylynn for months but never reached out to them-self protection remember? Then in October (I think), I read on the Children’s page that Kaylynn was considered terminal and my heart just broke. The Lord was telling me to befriend her mom, there’s no other way to describe it. I felt this unexplainable pull to her. So I messaged her on Facebook and we ended up meeting in the hallway and sitting in a side sitting room on the 6th floor for an hour one day while both of our girls slept. I know now, we were meant to walk the ‘terminal’ road together. These friends of mine mean more to me than I could ever tell them. I pray for their babies every morning and at night when I can’t sleep. I tell Soph about them when I visit her at the cemetery and I ask her to help them be brave like her. I will admit that I some days have a hard time texting them because….well….their kids are still here. But what’s so great about these friends is that-I know they understand and they love me still. I know they pray for me because they tell me every time they do. I HATE the circumstances that formed these friendships but oh how thankful I am for them. Today. 6 weeks after losing Sophie, I will walk down those halls to see ALL FOUR of my friends. They are ALL at the hospital right now. The halls are still full. Cancer doesn’t change and it doesn’t stop. I’m dreading the walk up the skybridge and the ride up that stupid talking Train elevator. But at the same time, I’m SO looking forward to hugging my friends and THE NURSES!!!!!!! Oh I can’t wait to hug me some nurses!!! I am a purpose driven person. Give me a task and I can make it work. So today, I have a purpose. Today I will hug my friends, pray for their children, bring them food, and bring goodies to make them all smile and feel a little less like cancer. I wish I could do more but, people did SO much for us that I’m so blessed to be able to do anything for my friends. Today, I ask you to pray for us and for our friends. 1. Pray for Jonathan and I as we walk those halls and hug those necks. Just pray for us. 2. Pray for Abigail. Her surgery is today to remove 2 nodules from her lungs and test them for cancer. This is HUGE for the remainder of her treatment. Pray that she recovers well and is CANCER FREE!! 3. Pray for Addie Leigh. Addie has been inpatient for over 2 weeks now with fever, no immune system, nerve pain, and viruses. Pray big that she will bounce back and be able to go home soon! Pray that PT will work miraculously for her legs and feet! 4. Pray for Jase. He was admitted yesterday for fever, RSV, and 2 viruses. He also has ZERO immune system. Pray that antibiotics will kick these problems and pray protection over him. 5. Pray for Kaylynn. While she is considered terminal, she is getting palliative chemo to give her time with her mama. 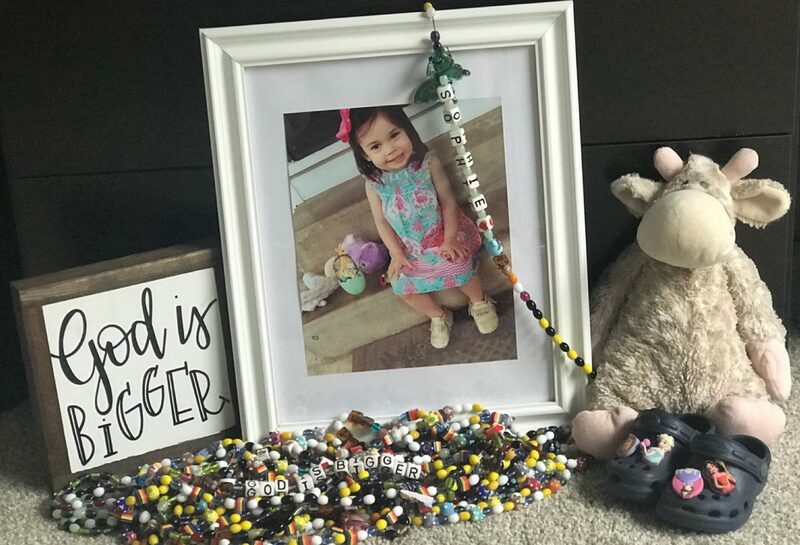 Pray for a miracle to save Kaylynn but also pray that she feels good and can make the most of her time with her family. 6. Finally, I ask you to pray about how you can help kids like this. Do some research into organizations that fund research for better chemo and cures! I know its a lot to pray for but, there’s a lot of kids….and a lot of cancer. They deserve so much more. God is still good and He’s still bigger. He’s big enough for this and so much more. Ohhhh the ministry He’s weaving for you! I know your presence will be such a huge blessing to these moms and the nurses. Keep saying, “YES!”, to Him. He is in the midst of creating something beautiful through you. Thank You for sharing your story. Sorry for your loss and may God bless you in your months ahead. Rest in peace Sophie. Thank you for sharing. I came across this while missing and thinking of sweet Kaylynn. My two granddaughters are Kaylynn’s half sisters and I see Kaylynn in them all the time. I cried when reading this thinking your loss and ours. God bless you and all those going through the pain losing a loved one and being strong for a loved one. We miss Kaylynn and am thankful for the love you brought to her life.